The glossy, black labu sayong is a State icon for Perak. 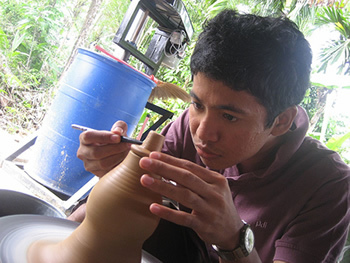 Instantly recognisable, labu sayong takes days of handwork in forming, firing, drying and engraving. 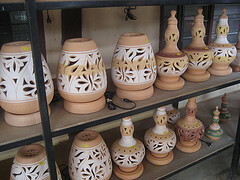 The gourd-shaped jars made of fine clay are carbonised using hot rice husk to give them that black gloss. For authentic labu sayong, go to Kampong Sayong, located in the backwater of Kota Lama Kiri near Kuala Kangsar. 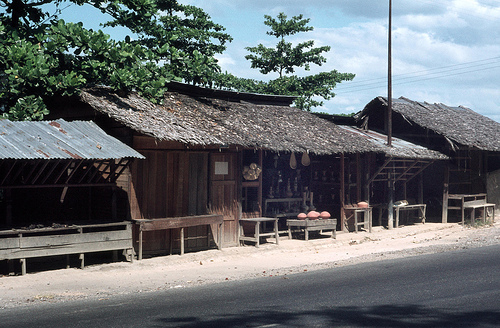 Road side stall selling the famous 'labu' pottery jugs from Sayong. On the former main highway, near Kuala Kangsar. Only river pebbles are used to polish the outer surface of the jar. With simple tools and limited machine usage, minor flaws on the jars are to be expected. Indeed, they are the best indication of handmade authenticity. Watch out for machine-formed jars that are identical and have traces of seam lines. They are brought in from elsewhere to ride on the popularity of labu sayong. Village artisans will gladly show you how it's done and even let you try your hands at it. But forming the clay to make containers is not as easy as it looks. There's more than just pottery at Aw Pottery. Here, you can find an ancient wood-fire kiln preserved as a showpiece, a legacy of the craftsmanship by its founder, the late Aw Eng Kwang. Fondly named "Dragon" because of its structure, this woodfire kiln was built by Aw, an immigrant from Chaozhou province in China. The factory is located behind the showroom, stocked with a wide range of products priced from 50 sen to RM200. While Aw Pottery is popular for landscaping, home and garden decor, don't miss the impressive award-winning creations displayed in the Aw Museum. For RM10, you can have a go at pottery making and get your masterpiece glazed and fired for collection in a week's time. This experience is limited to a visitors at a time and requires three days' notice. The 55-year-old has travelled to many parts of the world to learn the art of pottery making. He makes decorative flower pots and glazed cooking pots, gravy pots, oil lamps, vases etc. who runs his business with the help of his children and wife. 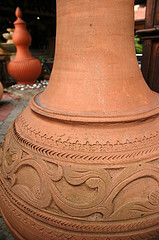 Traditional clay pots are better suited for charcoal and wood fire stoves. "As for oil lamps, many families come before Deepavali to buy these for their altars and homes. Some people even use oil lamps as candle holders." Ramadas is one of five families in Kuala Selangor in this business. "Kuala Selangor and Perak are famous for their clay pots," he says. "We have customers from all over the country."